For those of us who are interested in, and informed by the synchro-mystic nature of Universe and how it unfolds and reveals it's often cryptic information streams to us... 2017 has been a year of High Weirdness indeed. As is customary for media platforms such as Tek-Gnostics Network, we pause to take a retrospective look at our posts of 2017… at the year that was… the year of the monkey. For good or ill, 2017 revealed some fascinating, if not nefarious synchronicities… both horrific and hopeful. Before we take the plunge into 2018, let us draw a breath and take one last look at some of the highlights from 2017. Here are our top eight picks for 2017... in retrospect, the decerning reader may not only detect a distinct pattern emerging from our postings as the year progressed... but may also extrapolate upcoming syncs not yet manifest, but highly likely to emerge as we move into 2018. As wild as the ride was in 2017, there surely will be even wilder times in store for us as we venture forth into 2018... Buckle up dear, intrepid psychonaut... buckle up! Editor's Note: As the picture at the top of this post connotates... on February 16th, 2018 we enter the Year of the Dog in the Chinese Calendar. Our thoughts immediately go to the ancient Egyptian deity: Anubis. 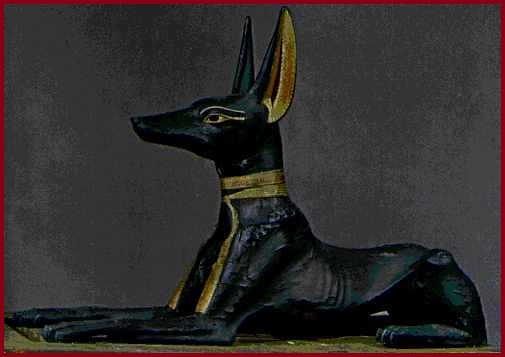 A precursor to Osiris, Anubis was a god who ushered souls into the afterlife. He attended the weighing scale during the "Weighing of the Heart," in which it was determined whether a soul would be allowed to enter the realm of the dead. As such, the upcoming year of the dog may be a year of reckoning, here aboard spaceship Earth. This reckoning may take many forms. It may take the form of environmental reckoning as the climate change chickens come home to roost. It may take the form of political reckoning as we all get the government we deserve. Who knows... it just may well mark a reckoning for those dastardly Powers That Be… the worldly Archons and their globalist minions, in their last gasps of patriarchal power. Stranger things have happened! Abundant Blessings to you and to yours in the coming year... have a Happy Noö Year and may your hearts be light as a feather!